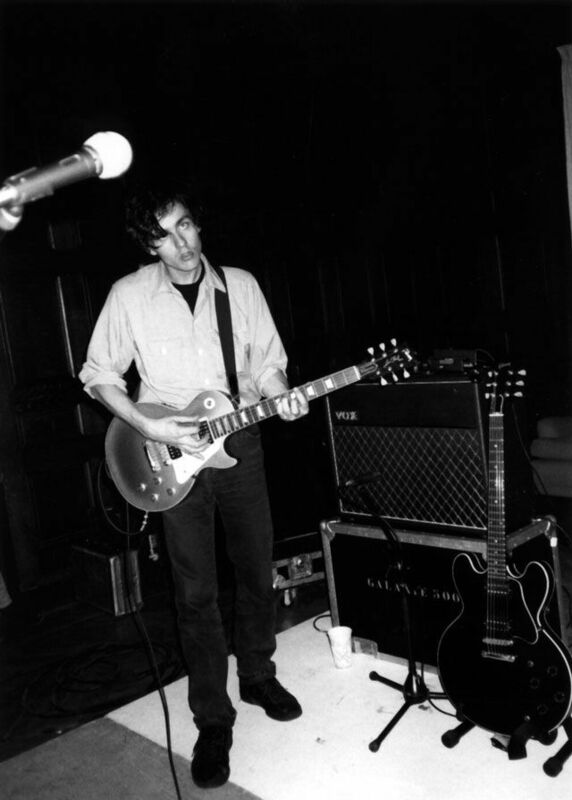 25 years ago today Galaxie 500 played their last show. 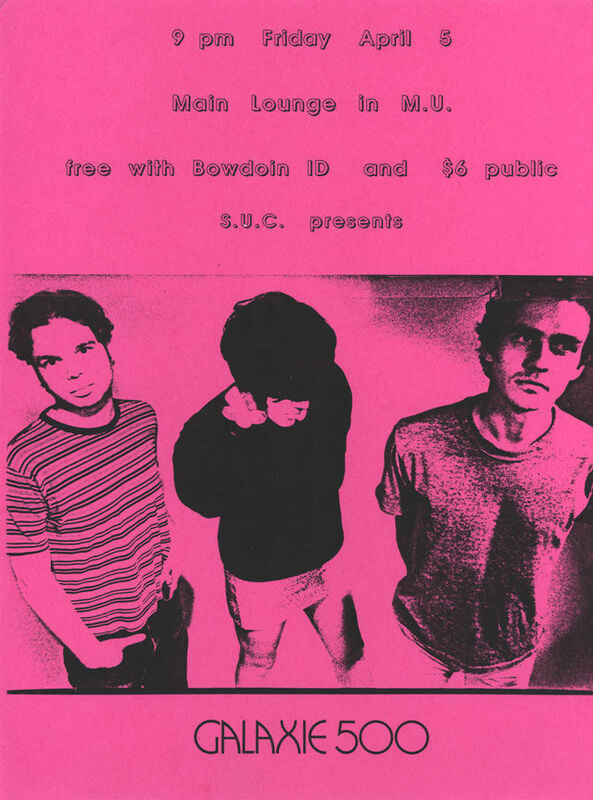 On Friday 5 April 1991 the band played at Bowdoin College in Maine. The band played in a building called Moulton Union, in the main lounge. A band called The Wishniaks, from Philadelphia […] opened up. Galaxie 500 played for about an hour and really didn't seem to want to be there beforehand, although they put on a phenomenal and truly hypnotic show. Dean drove a Dodge Dart to Maine. Damon & Naomi drove up in a blue Saab 900. 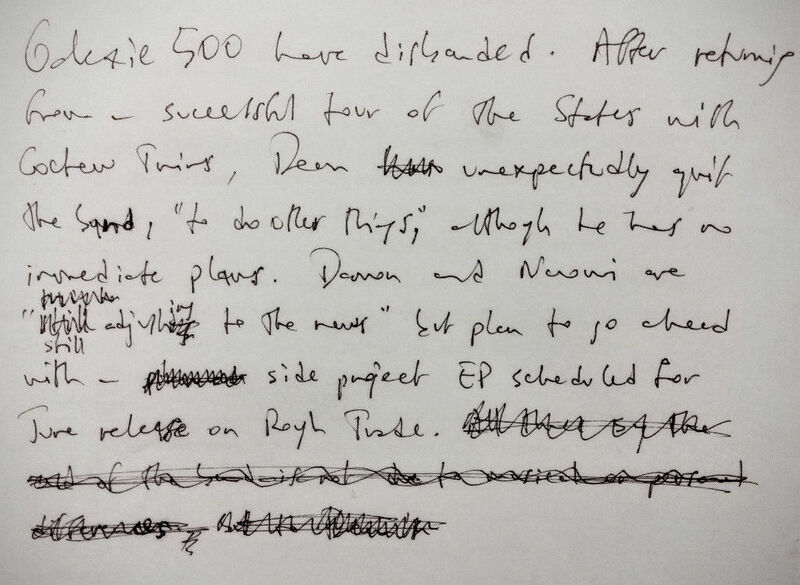 Damon had a drum kit that said Galaxie 500 in silver on the bass drum. Naomi wore orange leggings. About forty or fifty people came to the show. We were scheduled to go on at nine that night, but the opening band played for an hour and a half while we waited in the green room that the students had set up for us. […] We sat in that green room getting more and more irritated. And that was our final show. An annoying evening at Bowdoin College. I made it through the set, loaded my amplifier and guitar into the back of my blue '75 Dodge Dart and drove all the way home to New York City. I regret it ended badly - but that's how things often end. What happened was simply that Dean quit, more or less out of the blue, on the telephone one day […] in fact he didn't even place the call! 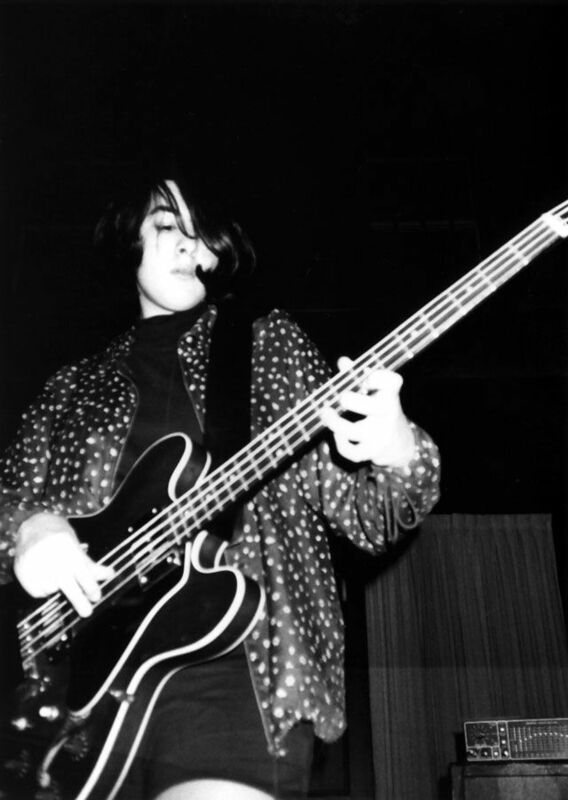 It was after we had finished what turned out to be our last tour, which was an opening slot for the Cocteau Twins in the States; we had an upcoming tour to Japan […] so I called Dean to say "let's buy our tickets", and he said no, I quit. No explanation, just "there's nothing more to talk about" and that was it. A lot of years of friendship, not too mention the band, down the drain in a minute. Damon called Dean to say he was going to buy our plane tickets to Japan for the tour we had booked there, and Dean said he quit.Damon asked why and Dean said he had nothing more to say to us. I couldn't believe Dean could just throw everything away so carelessly and not even want to discuss it. I got on the phone and did something I had never done before: I yelled at him and told him he was lazy and a selfish coward. Then I hung up. And on that heartbreakingly sad note Galaxie 500 came to an end. A tiny news item appeared in the Melody Maker a month later and we were left with three perfect albums and the memories.